When I picked up Paradise Valley by C.J. Box, I didn’t realize it was a serial killer novel. 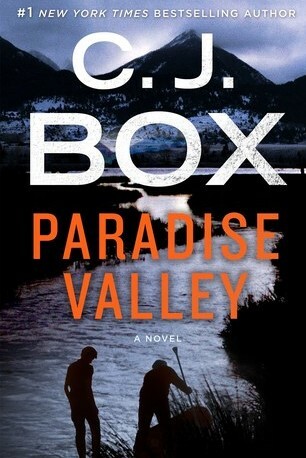 Seriously, from the cover, Paradise Valley doesn’t look like a serial killer novel. Usually there’s a bloody weapon or a terrified woman on the cover of a serial killer novel, but the image here is almost peaceful. It was my fault that I didn’t know Paradise Valley was a serial killer book. I usually read the book jacket before I grab a book, but since this was a bestseller on the library’s New Arrivals shelf, I snatched it before an old lady next to me could get to it (I don’t mean old lady in a derogatory way. It’s just her most noticeable characteristic. To her, I’d probably be the bald guy, or the awkward guy, or that guy who looks like a serial killer). Anyway, she gave me a dirty look when I picked it off the shelf, and I would have asked her if she was interested in it, but she had a cart. Once a library book goes into a cart, it’s not coming out. I saw several James Patterson books in that cart, so I knew the old lady was more concerned with quantity than quality. The next time I go to the library, I’ll pretend to slide a copy of Finnegans Wake from the bestsellers shelf and suggest it to the old lady. If she’s going to give me a dirty look anyway, I might as well give her a reason. Looking back, I should have given her Paradise Valley. I’m not saying it’s bad or anything. It’s just a serial killer book. I’ve read so many serial killer novels that most of them seem generic now. At least in Paradise Valley, the detective already knows who the killer is and is trying to set a trap, so we didn’t get the typical shock and horror and piecing together of clues. The reader doesn’t have to go through all that learning curve stuff again. Amazon calls Paradise Valley Book 4 in the Highway Quartet, but some reviewers are calling it book 3 in a trilogy, so I’ll go with what Amazon says. Either way, it’s not the first book in the series, but it didn’t take long to figure out what has been going on, even though I hadn’t read the previous books. It’s often frustrating trying to read the 4th book in a series first. Then again, if you can read the 4th book and understand what’s going on right away, why would you read the first three books? The serial killer’s name in Paradise Valley is the Lizard King, and it makes sense once it’s explained. The Lizard King isn’t the worst serial killer name ever. James Patterson made up a serial killer called The Dealer. That was pretty bad. I think The Dealer should have been the official end of serial killers. I’m not for limiting free expression, but if I could limit free expression in any one area, I’d probably say no more serial killer novels, at least for a few years. I mean, as far as free expression goes, hate speech is bad, and some people want to limit that, but you can argue about who determines what hate speech really is. Reasonable people can disagree about what actually makes hate speech and what its boundaries are. But more serial killer novels? If we say no more serial killer novels, is anybody really going to be outraged? If it happens, it’s not C.J. Box’s fault that serial killer novels would get banned. Paradise Valley just happened to be the book that caught my attention, that certain book that was at the wrong place at the wrong time. I’d blame James Patterson and The Dealer. When you need a literary scapegoat, always blame James Patterson. Before you read another book that you’re not sure about, check out Dysfunctional Book Reviews! I think the author’s name is definitely in a serial killer novel font.